This magnificent necklace features long Necklace 40 inches can wear as 1 or 2-strand Necklace. Features onyx 5mm beads coral stone Spacer Blue Turquoise & other multi semi precious stones accented in long beautiful 40 inches necklace. A cluster of iridescent semi precious beads Long Necklace dresses & would look pretty with many of dresses. Celebrate your individuality. 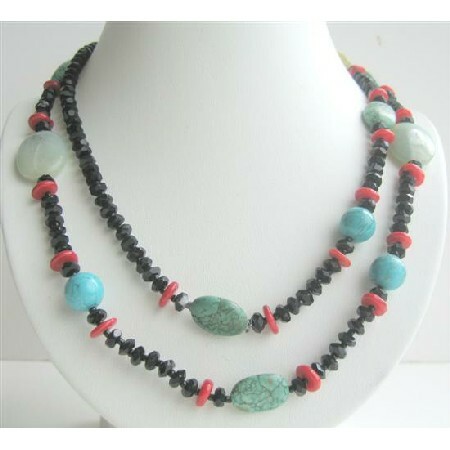 Variations in the color & pattern of each onyx coral & turquoise beads add the beauty to the necklace.